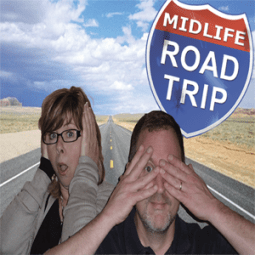 Navigating a road trip with others can be a tad stressful if you don’t set parameters in advance. By mapping out some driver and passenger guidelines for carpool etiquette in advance, you will avoid hurt feelings and backseat blowouts on the road. Whether you’re cruising California‘s Pacific Coast Highway, taking a nostalgic drive down Route 66, or simply taking the turnpike to grandma’s house in Miami, planning ahead will bring you peace of mind later. We have two very different personalities, and with that comes two very unique and contrasting travel styles. Here are a few simple tips, his way and her way, to help make sure your next road trip is smooth sailing. Depending who’s in the car with you, your taste in music will inevitably differ. His way: Set aside blocks of time where each passenger can select the soundtrack for the car. You can create individual soundtracks to share before ever hitting the highway. Her way: Get everyone a pair of ear buds (and buy extras at the dollar store) so each passenger can listen to their personal device and playlist, audiobook, etc. To avoid that age-old argument about who is going to ask for directions, download an app or two. His way: Sit or Squat tells you where you can find adequate restrooms, rated and reviewed by previous users. GLYMPSE allows others (of your choosing) follow along on your route in real time. Her way: WAZE gives you detailed directions and up to the minute traffic information that includes accidents, gridlock, roadside debris, and police while giving you a choice of routes. TV Food Maps is a road map to over 4,000 restaurants featured on some of your favorite television food shows, from Bizarre Foods America to Top Chef. Taking that last bit of trail mix without asking will turn a happy go lucky road trip into a hangry mob scene. Be considerate of others. If you buy a roadside snack, get enough for everyone and whatever you do, don’t be the one to eat the last of anything, especially if you weren’t the one who bought it. His Way: Beef Jerky is a staple on any of Rick’s road trips. From Alligator to Bison teriyaki, he never goes hungry. Her Way: Nuts and dried fruit are Sandi’s preferred snack du jour. Bottled water is a must. A hydrated passenger is a happy passenger. Viewfinder Tip: Check your dashboard for a picture of a gas pump with an arrow. Whichever way that arrow points, is the side of the car your gas cap is on. If you are road tripping with friends, discuss the budget in advance. How will you split the gas? How often do you want to stop? Are drive-throughs your jam or do you want a sit-down meal with waitress service? Are you cool with the Dew Drop Inn Motel or do you prefer a 5-star hotel? Talking it out in advance will avoid any frustrations (and busted budgets) later. His Way: He’ll stay in a roadside tepee (so long as it had Wi-Fi) making it part of the adventure. Rick is happy with the basics, anything unique and off the beaten path. Her Way: Her tepee better have 800-thread count sheets and room service. Luxury linens and a good night sleep are what keep Sandi smiling on a road trip. Temperature can result in a heated argument if one rider likes bone-chilling temps and the other prefers it hot, hot, hot! His way: Rick is easygoing and not much ruffles his feathers. He easily adjusts to any temperature with a tall glass of iced tea in hand. Her way: Either too hot or too cold, Sandi brings a pair of socks, and a sweater or a pashmina to deal with temperature changes. Road trips can test even the most laid-back individuals. Let small things go. Loud chewers drive me crazy, but for the good of all, I refrain from commenting. And, we all have that crazy uncle or goofy friend who thinks it’s hilarious to say “pull my finger” and then lock the windows as the gaseous fumes fly. Don’t fall for that age-old trick and for goodness sake don’t be the crazy uncle. And last but not least, don’t be a backseat driver. Don’t offer your advice unless the driver asks for it. What is your best tip for avoiding carpool conflict on a road trip? OK, I would like to see you drive with that tall glass of iced tea, Rick. Car rentals is an important issue which can be lil tricky at times. we had a good experience with http://www.economybooking.com few times. just liked to mention.